Kids will not eat cookies just because they are good. Sometimes we have to attract them by making the cookies in shapes like cartoons etc. 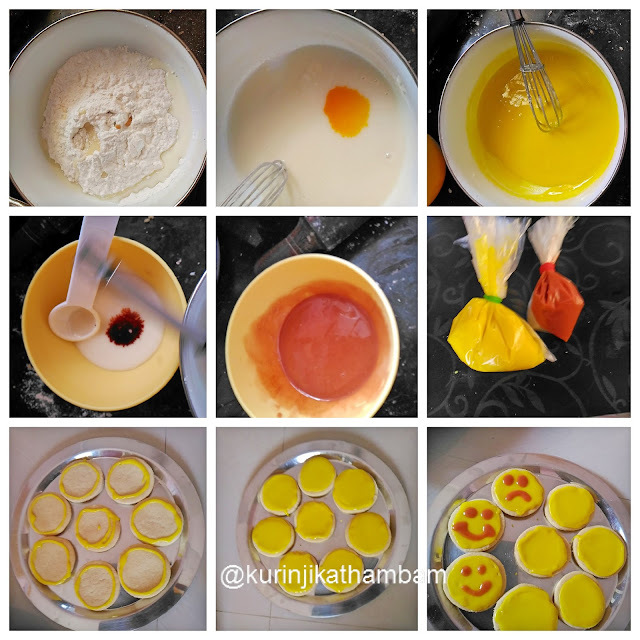 Smiley is a simple and easy to make shape yet the cartoonish feel makes kids fall in love with them. This Cookie was a big hit in our family and I strongly recommend this to be tried out. 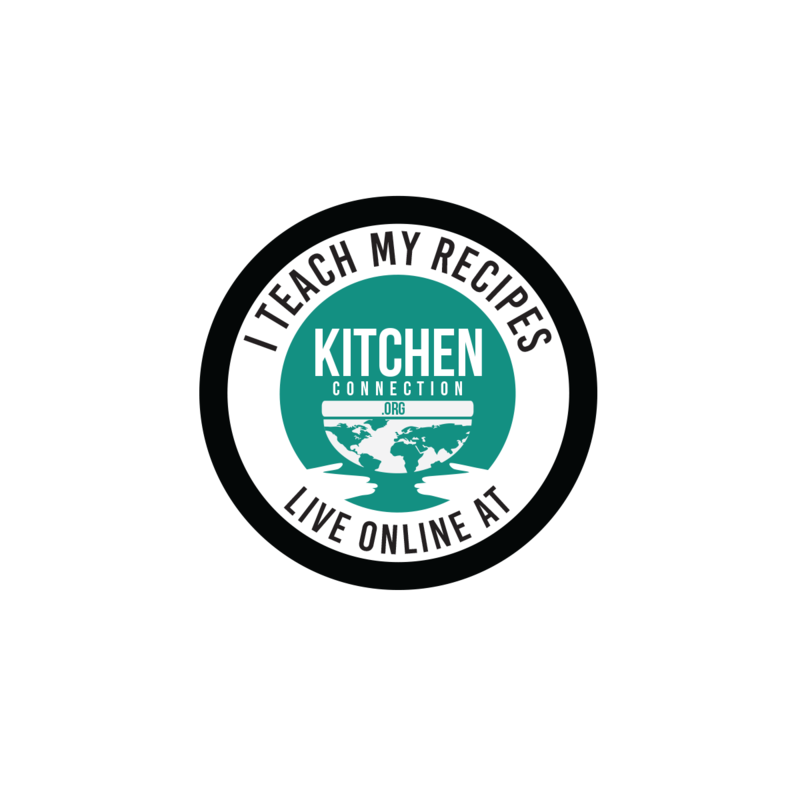 Click here for Homemade Icing Sugar Recipe. 1. Add the butter in a wide bowl. Beat the butter using the electric beater or hand beater or wire whisk till it becomes fluffy. 2. Now add the icing sugar and vanilla essence, mix them well. Then beat it till the mixture becomes fluffy. 3. Now add the wheat flour and mix them well. Knead it into a pliable and soft dough. 4. 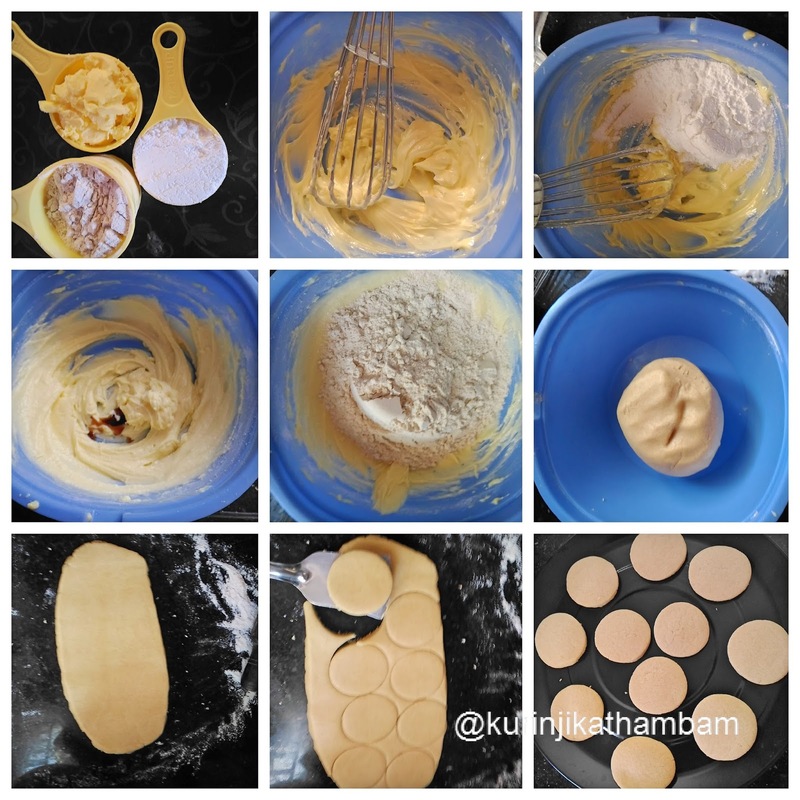 Roll the dough into ½ inch thickness circle (like chapathi) on the dry rolling surface using the rolling pin. Before rolling, sprinkle the wheat flour over the rolling surface to avoid the flour getting sticky. 5. Now cut the rolled circle using the 2 inch diameter circular shape cutter. 8. Bake the cookies for 10 mins at 180 degree Celsius. 10. Now take 1 cup of icing sugar in a bowl, add 1 tbsp of milk and vanilla essence. Mix them well with whisk till they become pouring consistency. 11. Now divide this icing mixture (from 10) into ¾ and ¼ parts. Pour them into two separate bowls. 12. Add yellow color to the 3/4th quantity bowl. Mix them well and keep it aside. 13. Add brown color to the 1/4th quantity bowl. Mix them well and keep it aside. 14. Pour these two mixtures into the piping bags or squeeze bottles or thick plastic cover with small hole. Close the bags tightly. 15. Now using the yellow color icing draw the outer circle for the cookies. Leave it for 5 mins. 16. Then fill the circles with the yellow color icing. If the icing mixture is too thick you can add 1 tsp of water. Leave it for 10 mins. 17. Now you can draw eyes and mouth using the brown color. Leave it for 5 mins. 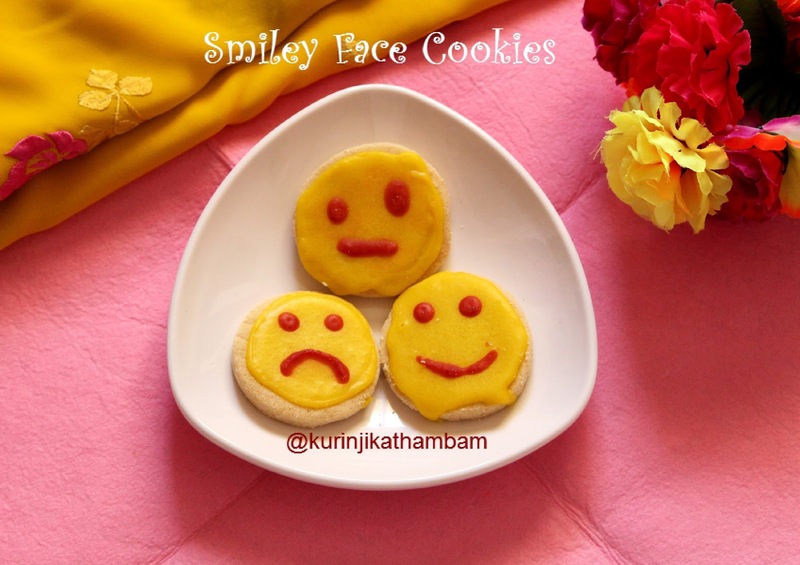 After 5 mins your smiley cookies are ready to serve. a cute treat for kids.